Fatigue started to set in for Hays High senior Kate Mondragon as she labored to carry a 180-pound dummy past a set of orange cones. Decked out in firefighter bunker gear, helmet and oxygen tank, Mondragon paused several times wanting to rest. But all around her, fellow students and instructors encouraged Mondragon to finish, even as her body didn’t want to. Armed with an extra bit of adrenaline, Mondragon finished dragging the hefty, lifeless body across the way, which allowed her to move onto the next workout station. Such is routine for Mondragon and the class of 12 students who make up Hays CISD’s Firefighter Academy, which is part of the district’s Career and Technology Education (CTE) program. Freddy Roland, instructor of HCISD’s Firefighter Academy and a current Kyle Fire Department firefighter, said the two-year program allows students to earn certifications in civil service careers. Some of the certifications include the Texas Commission on Fire Protection (TCFP) certification and Emergency Medical Technician. From there, students can potentially find jobs straight out of high school. “We want to offer something that is tangible, that is there and, if they are interested, they can turn it into a career,” Roland said. Origins of the program began in 2017 when Suzi Mitchell, HCISD CTE coordinator, met with Kyle Fire Department Chief Kyle Taylor on the possibility of starting a program. Roland, Taylor and Mitchell then observed a similar firefighter academy offered at Austin LBJ, which helped them “straighten out” our ideas, Roland said. 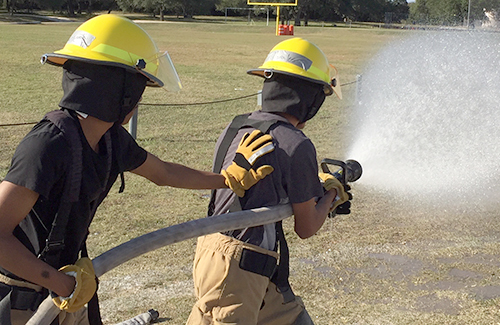 HCISD’s fire academy program incorporates a wide range of certifications that “are going to help them out, no matter if they want to stay on as a firefighter or EMS,” Roland said. Those certifications extend to jobs in the armed forces or in law enforcement, along with emergency management. Roland said Austin Community College is grandfathering the program and is also offering it as dual credit. Students who participate pay $250 per semester to be part of the program. Roland said the cost is a “deal,” as trying to obtain similar fire and EMT certification privately can cost close to $6,000. “Educating kids at a low cost and giving them an opportunity to run equal with those who pay $6,000 to get certifications is a deal,” Roland said. Keeping the program dual credit is also important as students can obtain as many as 12 to 15 college hours, which they can keep, even if they don’t go into any civil service job. The course, which encompasses four semesters, offers both traditional and hands-on learning. Roland said the course is “full-blown experience” where students are exposed to the rigors of the civil service industries. Developing future leaders in civil service is the key, Roland said, which is done through the many workouts students in the fire academy accomplish. The experiences are similar to what trainees at fire stations go through. During the first year, Roland said many students didn’t fully realize the gravity of their course, which has real world and real-life implications. But for many of the students, getting a chance at a tangible, real-world experience such as the fire academy has been beneficial. Hays High senior Dallin Roberts said he entered the fire academy after he stopped playing football due to a concussion. Roberts said the academy has since become his primary program. Lehman High senior Jaime Morales said entering the program was “nervewracking” at first, but was also exciting at the same time. Moreales said it was an “honor” to be a part of the program. Mondragon, a Hays High junior, said the course doesn’t feel like a “normal class at all.” However, she said going through all of the course work and physical workouts benefits students in the future. See more photos from Hays CISD’s fire academy here.